Trust Bank Job Circular 2019 will be publish in National daily and their official website. Trust Bank Management Trainee Officer Job 2019 will be publish in this year. You can see the circular or know all other information from our site. Trust Bank Job Circular 2019 will b publish their official website and national daily newspaper. This is a progressive commercial bank of this country. 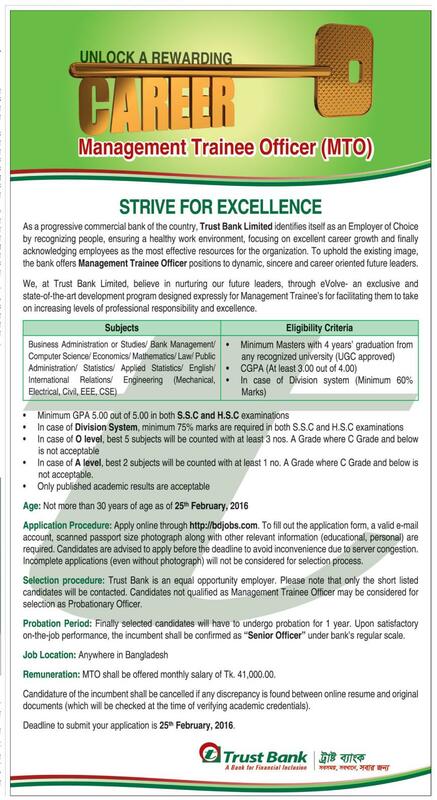 So Trust Bank Limited identifies itself as an Employer of Choice by recognizing people, ensuring a healthy work environment for the organization. To uphold the existing image, the bank offers Management Trainee Officer positions to dynamic, sincere and career oriented future leaders. Educational Qualification: Please follow job notice. Remuneration: MTO shall be offered monthly salary of Tk. 41,000. Minimum Masters with 4 years graduation from any recognized university (UGC approved). In case of Division system ( Minimum 60% Marks). Minimum GPA 5.00 out of 5.00 in both SSC and HSC examinations. In case of Division System, minimum 75% marks are required in both SSC and HSC examinations. In case of O level, best 5 subject will be counted with at least 1 no. A Grade where C Grade and below is not acceptable. Age Limit: Not more than 30 years of age as of 25th February, 2016. Apply online through their official website. To fill out the application form, a valid email account, scanned passport size photograph along with other relevant information ( educational, personal) are require. Candidates are advise to apply before the deadline to avoid inconvenience due to server congestion. Incomplete applications ( even without photograph) will not be consider for selection process. Trust Bank in an equal opportunity employer. Please note that only the short listed candidates will be contacted. Candidates not qualifier as Management Trainee Officer may be considerer for selection as Probationary Officer. Probation Period: Finally selected candidates will have to undergo probation for 1 year. you must check all that all information is right. After check when you see that all information is correct then click send button. If you need more information then visit their official website.